Chancellor Blumenthal and CASFS Director Patricia Allen were all smiles during the ceremonial groundbreaking, as Garden Manager Christof Bernau looks on. Photo by Tana Butler. Thanks to the generous support of individuals, businesses, and foundations, the Grow a Farmer campaign to raise funds for permanent apprenticeship housing at the UCSC Farm was a success, and construction is slated to be finished by spring. 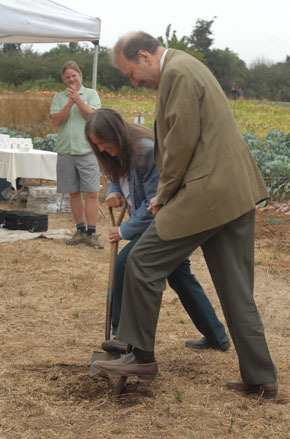 At a groundbreaking celebration, Chancellor George Blumenthal thanked contributors and hailed the uniqueness of the Center for Agroecology and Sustainable Food Systems's research and education programs, which include the UCSC Farm, the Alan Chadwick Garden, and the Apprenticeship in Ecological Horticulture. Founded 42 years ago, the apprenticeship was "literally and figuratively groundbreaking," said Blumenthal, noting that UCSC's six-month, full-time organic training program has paved the way for sustainable-agriculture programs at other universities. "The UCSC program has served as a model," he said. "The kind of education that all of you are supporting at this farm is sorely needed today." More than 1,300 people have graduated from the apprenticeship, which draws more than 50 percent women each year at a time when fewer than 15 percent of U.S. farm operators are women, added Blumenthal. "With your support, we have helped ensure that this program will stay strong, to continue this important training for yet another four decades and beyond," he concluded. Permanent on-site housing ensures that apprentices will continue to live on the Farm, keeping the program more affordable and accessible, as well as giving budding farmers the chance to "live where they learn." "With the construction of the permanent housing, we will be laying the foundation for another 40 years of organic training at the UCSC Farm & Garden," said apprenticeship development coordinator Ann Lindsey. More than 400 individuals and 60 businesses contributed to the campaign, with donations ranging from $25 to $50,000. More than $440,000 was raised, which will fund the construction of nine 4-unit cabins that will house 36 apprentices. The project includes redwood-and-canvas cabins, solar showers, accessible parking and paths, and other infrastructure. Construction is slated to be finished in time for the arrival of the 2010 class of apprentices in April.